How the call to empathy helped mobilize a nation. On May 5, 1964, four months after Lyndon Johnson committed America to a “War on Poverty,” Sargent Shriver addressed a meeting of the Advertising Council in Washington, DC. At the time, Shriver was working two jobs: he was head of the Peace Corps and, simultaneously, had been tapped by the new president as a special assistant to run Johnson’s anti-poverty initiative. For Shriver, the language in which the problem of poverty and the lives of the poor were framed was of critical importance. 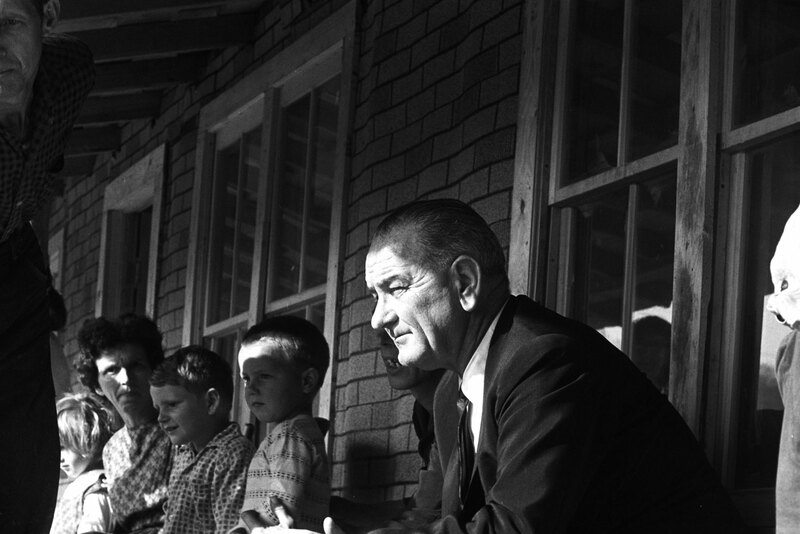 At the time, he was campaigning to get Congress to pass the Economic Opportunity Act (EOA), the legislative foundation for Johnson’s War on Poverty. He was also busy creating the Office of Economic Opportunity, which would serve as the political and intellectual nerve center of the multipronged campaign. Working long hours, he and an all-star anti-poverty team—among them John Kenneth Galbraith, Saul Alinsky, future AFL-CIO head Lane Kirkland, Michael Harrington and a slew of others—brainstormed strategies to build up job training programs; involve community groups in local rejuvenation efforts; bring legal services into poor communities; and improve the nation’s decaying infrastructures for physical and mental health, proper nutrition and drug treatment. But they quickly found their ideas butting up against public perceptions. More than four out of five Americans, according to opinion polls, believed the anti-poverty campaign to be unwinnable. Perceptions, the War on Poverty’s A-team realized, could make or break their effort. If the myths and clichés remained intact, it would be a hard slog to get the EOA passed; but if they were increasingly held up to the light and challenged, Shriver believed, the administration could build irresistible momentum for the bill’s passage. Shriver and his team understood this, and as they worked to prevent existing biases from derailing the War on Poverty, they did so in a way calculated to draw on that long tradition. So when Shriver addressed the ad executives on behalf of his boss’s program, he was asking them to use their skills to do the same: to catalyze a collective empathetic surge. Shortly afterward, with the administration relentlessly focusing on telling the real-life stories of America’s poor and breaking down the clichés about poverty, Congress passed the EOA. In January 1965, still riding the waves of Johnson’s electoral landslide over Barry Goldwater, the administration unveiled a raft of specific policy initiatives to deal with poverty. For the next decade, under presidents Johnson and Nixon, the government would devote more financial resources to fighting poverty than any previous administrations except, arguably, Franklin Delano Roosevelt’s, and more political capital than any administration since. The poverty rate in the United States would, by the mid-1970s, decline to 11 percent. That was still 11 percent higher than Johnson had wanted—his pledge, after all, was to eliminate poverty completely—but it was also roughly half of what it had been during the Eisenhower presidency. For a brief moment, the affluent society was being judged by its most powerful denizens according to how it treated its most vulnerable and most invisible. It was, in hindsight, a high-water mark. Far from failing, the War on Poverty was a resounding success by many measures. With help from the Great Society program of Medicare, millions of elderly Americans became economically secure. Through programs like Head Start, millions of youngsters were given a fairer beginning. In the South in particular—long home to epidemics of malnourishment—nutritional programs dramatically reduced hunger. But the on-the-ground successes weren’t matched by an equivalent long-term shift in attitudes. By the late 1970s, a majority of the electorate was growing impatient with the escalating costs of these programs. And in the decades since, poverty and its accompanying scourges—food insecurity, homelessness, inadequate access to medical care, poor schools—have all made a dramatic comeback. Today, almost all of the benefits of economic growth flow up to the wealthiest 5 percent of Americans—and even within that narrow band, a grossly disproportionate share of the gains go to the tiny sliver of the top 1 percent. The further down the economic ladder one finds oneself, the more one is vulnerable to stunningly destructive financial trends. For the bottom quintile of income earners in particular, real wages have declined massively in the past decades—accelerating trends unleashed in the mid-1970s, just as the efforts of the War on Poverty were drawing down and the “war on crime,” which would ultimately see the United States become the world’s largest incarcerator, was ramping up. Today, nearly 47 million Americans live below the poverty line. And 22.5 percent of kids, according to Census Bureau data, live in impoverished households. But until the fiftieth anniversary of the War on Poverty focused attention on the issue, the conversation in Washington and in most state capitals hasn’t been about their plight. Rather, at least since the 2010 midterms, it’s been about cutting their access to benefits like food stamps, limiting expenditures on programs like Head Start, and attempting to drug-test applicants for welfare and, in some states, for unemployment benefits. For much of the electorate and a good portion of the country’s political elite, the poor have returned to their old Victorian status as undeserving and morally problematic, their poverty a sign of failure and sloth. This is a far cry from the optimism of 1964. In its first phase, the War on Poverty embodied hyper-democratic aspirations, based largely on the concept of “maximum feasible participation” advanced by Shriver and Robert Kennedy. The idea was simple: poverty was a multiheaded monster, and slaying it would require multifaceted responses, among them efforts that did not impose solutions from above but instead deeply involved communities in attempts to reshape their neighborhoods and towns. In the months following the 1965 State of the Union, a slew of fascinating experiments were set in motion: Legal Services, which gave poor individuals and local organizations access to the courts when dealing with civil issues; Community Action Programs, which directly funded local groups to build up local infrastructure; the Job Corps, to train workers and, in particular, provide jobs to impoverished teenagers; Head Start, to give low-income kids early education opportunities; Community Health Center programs; and so on. In all, some twenty programs were brought into being under the umbrella of the Office of Economic Opportunity. For one relatively brief moment, the state was aggressively funding legal actions that could be used to empower the weak and vulnerable against the state itself, as well as large corporations and all the other institutions that, historically, had stacked the deck against them. Ironically, given the political hay that Richard Nixon made lambasting welfare and appealing to the angst of the conservative “silent majority,” handout politics suited the Republican president just fine: Nixon dismantled the Office of Economic Opportunity and had its agencies absorbed into other parts of the traditional welfare-distribution system. But he also made sure that paying attention to poverty remained a central part of his presidential responsibilities. It was Nixon—a man who came of age in the Depression and understood firsthand what hardship looked and felt like—who tentatively embraced Milton Friedman’s call for a basic income guarantee. It was Nixon who expanded anti-hunger programs. And it was Nixon who proposed a pathway to a universal healthcare system similar to the one envisioned in the Affordable Care Act more than a generation later. There is a powerful irony in this inversion that is a mark of Nixon’s success and a measure of the ground lost. Indeed, when Ronald Reagan lambasted “welfare queens” in 1976 and went on to win the 1980 presidential election in part by marshaling opposition to the welfare state; when Republicans today bemoan the handouts mentality; when Rush Limbaugh attacks hungry kids on summer feeding programs as “wanton little waifs and serfs”; and when Paul Ryan accuses food stamp recipients of, in effect, lounging around on hammocks, they were and are attacking Nixon’s vision of anti-poverty programs as social pacification tools far more than the original vision of the War on Poverty. At the same time, in relentlessly attacking anti-poverty programs and the Nixonian handout strategy—as well as the very assumption that the modern state has an obligation to intervene systemically against poverty—conservatives have created a powerful shift in public attitudes on poverty and poor people. We have witnessed a great unraveling of large parts of the social safety net and an extraordinary willingness to believe the worst about the poor and to fund an incarceration safety net—made up of a vast web of prisons and jails—to deal with the consequences of poverty. Linguistically, from 1964 to today, the dominant discourse has shifted from seeing poverty as the problem to framing poor people and their perceived dysfunctions as the primary challenge. It makes it far harder today to push for the kind of big-picture anti-poverty strategy that was born in 1964. When President Obama defends the Affordable Care Act, or when he acknowledges that escalating poverty and inequality are the great domestic challenges of the moment, he marshals some of the same rhetorical devices used to sell the War on Poverty. In those instances, one can glimpse once more America’s empathetic ideals struggling for air. But Obama’s efforts to bring poverty to the fore of Americans’ consciousness have been halfhearted. He hasn’t yet sought to re-create a national call to empathy akin to the beginning of Johnson’s War on Poverty. At the same time, when opponents bash the Affordable Care Act, oppose increases to the minimum wage or insist on curtailing extended unemployment benefits, they reach deep into that grab bag of myths and clichés about poverty that Sargent Shriver was so critical of a half-century ago—a linguistic world of unempathetic language about the lives of America’s modern-day poor. For legal scholar Peter Edelman, however—a man who cut his teeth in the early phase of the War on Poverty—empathy alone won’t banish poverty from this wealthy land. “It’s about power,” Edelman says. “About organizing. About people being involved in politics and doing something to make their lives better.” And, by extension, it’s about a language of politics that explains how power is distributed and how it is used. That the War on Poverty has been so tarnished in the public imagination, Edelman says, is in large part because conservatives have been allowed to dictate the terms in which it is discussed, replacing an epoch of empowerment politics with the idea that 1960s radical social policies were all about breeding dependency and sloth. But, he adds, it wasn’t a failure at all.